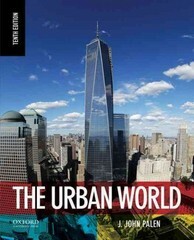 The Urban World 10 Edition Long the leading text in urban sociology, The Urban World continues to provide a comprehensive, balanced, up-to-date, and cross-cultural look at cities and suburbs around the world. Offering a twenty-first-century view of the changing urban scene, the text covers evolving urban patterns and the changing nature of urban life. Combining expert scholarship with an accessible style that students appreciate, J. John Palen is one of America's leading urban sociologists. He travels the world and adds fresh insights, gleaned firsthand, to each edition of his text. Featuring an exceptionally clear writing style, The Urban World is also enhanced by such enduring features as robust academic content and an instructor-friendly organization. The book is accompanied by a comprehensive test bank and PowerPoint-based slides for qualified instructors.